Tales of Zestiria Collector's Edition Unboxing! AAAAAHHHHHH! It’s here! I finally got my copy of the Tales of Zestiria Collector’s Edition last night! 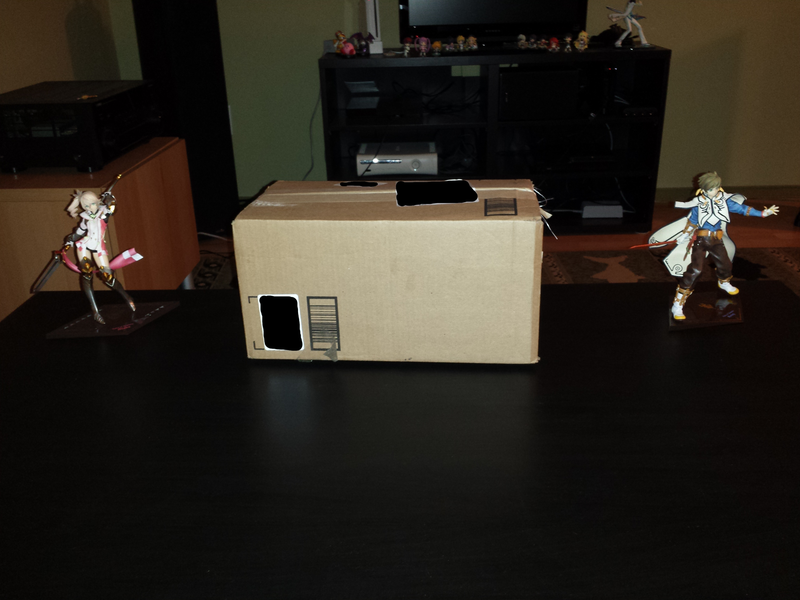 As you can see I brought my Sorey and Alisha figures over to the coffee table to get in on the action. Please excuse a few blurry pictures (I have shaky hands) and let’s dig in! Ok, time to crack this puppy open! I can see the back of it! But we gotta go deeper - I’m skipping a photo because it turned into a blurry mess, but the next one is effectively the same and is minus the box it shipped in. Bam! I cropped these and put them all side by side so you wouldn’t have to scroll down through 4 enormous images. Yup, the two in the center turned out horribly blurry. Darn you, shaky hands! ....Well, now I know why the box got dented. that flimsy thing was the ONLY thing protecting everything inside, except for a lot of empty space between the contents of the box, and the box itself. Damn it, Bandai Namco USA, why did you skimp on the packaging? The European CE looked way sturdier than this! Even the Symphonia Chronicles CE was sturdier here in North America, and had just as much stuff including 4 of the same type of figures. Why couldn’t you have packaged this similarly? Everything out of the box and laying on the coffee table. Oh look, I got both sides of the box that were blurry before to not be blurry in this picture! Nice! As with most figures, some assembly is required. I took far longer than I expected to figure out how to put these things together. I looked all over the Sorey figure trying to find the hole for the post only to find that it inserts into the side of his crotch (ouch)! Also, Mikleo’s staff and Alisha’s spear are attached to their hands with very, very tiny bits of plastic that fit into just as tiny slots in their hand. Both are likely to fall out if you so much as move or pick up the figures unless you glue them in. Once assembled, I placed them on the coffee table between my larger Sorey and Alisha figures, but those pictures didn’t turn out due to the dim lighting near my coffee table - with the flash on, the figures turned into pure white silhouettes, and without the flash you couldn’t see jack. So I moved them over to my media shelf where the larger Sorey and Alisha used to reside for the following picture. Wow. That is probably the clearest picture I have ever taken! Moving on - we’ve still got things to cover! I am aware the following photograph is way off center. Sue me, photography is not my strong suit. The Steelbook case looks great, modeled after the Celestial Record book in the game. Inside, we have a “Special Selection” CD (I’ve always found these a little pointless as they are not a full soundtrack), an extra spot for the game itself, and tabs on the other side to hold the manual. Also yes, that is my hand. STOP THE PRESSES! We now have proof that Tenshi is a human that exists. The mystery, if there ever was one, is solved. The world may never be the same. Next up, we have the art book! I was going to take a picture of the inside, but then I’d have no idea what page(s) to feature. It’s also pretty standard fare for an art book. Probably the most interesting inclusion to this collector’s edition, we also have the retro keychain set! The box had a little round tab cut out of one end, which seemed to indicate that was the side to open. This was the wrong assumption. I tried to get a good grip on that end to open it without destroying the box for a good 5 minutes before switching to the other end which opened with ease. Hold the box with the Tales of Zestiria logo upright, and the box opens on the right-hand side allowing you to slide out the keychains, also upright. I feel rather silly now and want my 5 minutes back. The final bonus item we have in the CE is the Tales of Zestiria ~ Dawn of the Shepard ~ anime OVA episode. I’ve yet to watch it, but I hear that it covers the first hour and a half or so of the game. I want to make sure I’m at least that far before I watch this thing. Last up is the game itself. Oh how many months I had waited to play you. So that’s the entirety of the North American Tales of Zestira Collector’s Edition! Now please excuse me while go I lose myself in the latest game in my favorite series. If nobody hears from me for a month, don’t panic. Just send gels, and maybe some mabo curry - in case I forget to leave the apartment and run out of food.